The Envision Eugene process is approved of, but a quarter of respondents don’t have an opinion – even after pressing for leaners. This implies it was not widely communicated to the public. 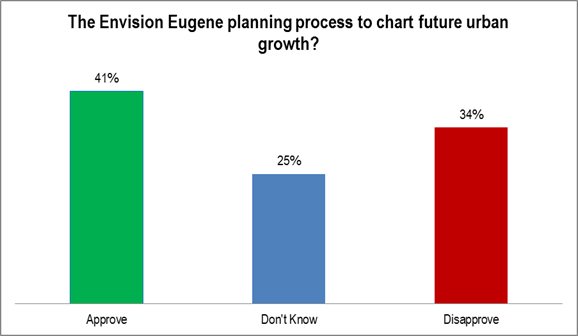 QUESTION: Do you approve or disapprove of the Envision Eugene planning process to chart future urban growth? 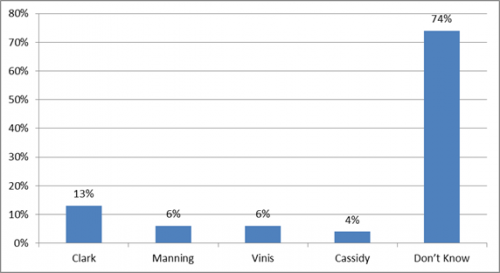 METHODOLOGY: Live telephone interviews of 200 City of Eugene likely 2016 primary election voters were conducted the nights of July 20 and 21, 2015. The margin of error at the sample median is 7%. Totals may not add up to 100% due to rounding. Expanding the urban growth boundary is now supported by a small margin among primary voters. 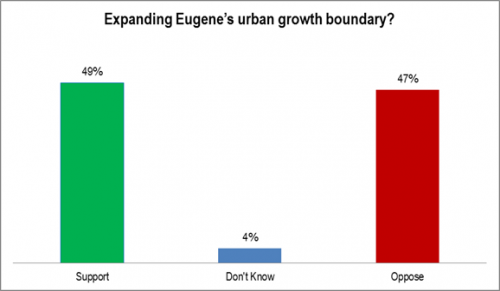 QUESTION: Do you support or oppose expanding Eugene’s urban growth boundary? 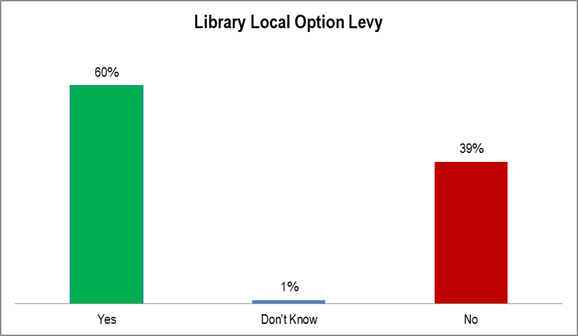 The November library levy enjoys a solid margin of support among likely primary voters. There are two caveats to the results presented here. Both could create bias. First, the sample is composed of are likely primary election, not likely November special election, voters. 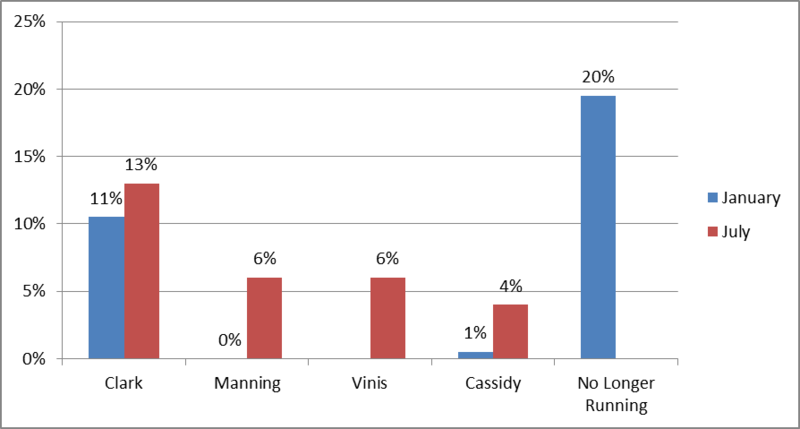 The poll was primarily intended to address the 2016 mayoral primary. Primary voters are a bit more partisan and a bit younger than the voters likely to turn out in November. Second, the wording does not match the actual ballot wording. The actual wording was not available by the deadline for finalizing the question wording. The wording here is a bit more favorable than the actual wording and, therefore, could bias the poll results upward. Subsequent polling on this issue would both use a November Special election sample and the actual wording of the ballot measure. QUESTION: A five-year Eugene property tax levy for the library will be on the November 3 ballot. It would increase hours, especially at the Bethel and Sheldon branches, buy more books and technology, and expand programs. It would levy $2,700,000 per year or 17 cents per $1,000 of assessed value or $36 per year for the average Eugene home. If the election were held today, would you vote yes or no? ACTUAL WORDING: Five-Year Library Local Option Levy. Shall Eugene levy $2,700,000/year for five years, beginning 2016-2017, to increase library hours and expand other library services? 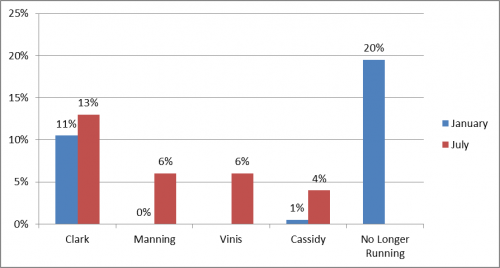 Nearly three quarter of likely primary voters don’t know whom they would support for mayor. This is up slightly, but still very high. These percentages continue to be well below comparable levels the last time Eugene had an open seat, in 2003. QUESTION: As you may know, Kitty Piercy has announced she will not run for re-election as Mayor of Eugene. Several candidates have expressed a public interest in running for mayor. If the Eugene mayoral election were held today, would you vote for: Mike Clark, James Manning, Bob Cassidy, or Lucy Vinis [ROTATE NAMES]? IF DON’T KNOW: Which way would you lean? For the January results see: http://lindholmcompanyblog.com/?p=11709. For the 2003 results see: http://lindholmcompanyblog.com/?p=11719. Whereas the Eugene City Council is extremely happy about City Manager Jon Ruiz (reference below), the likely primary voters next May are decidedly more lukewarm. The “Excellent” plus “Good” percentages are slightly less than the “Fair” plus “Poor” percentages indicating a net disapproval of 10%. Perhaps this disparity is entirely predictable. Few voters go out and openly declare how much they love bureaucrats! QUESTION: Now, I would like to ask you some questions about how local government is doing. 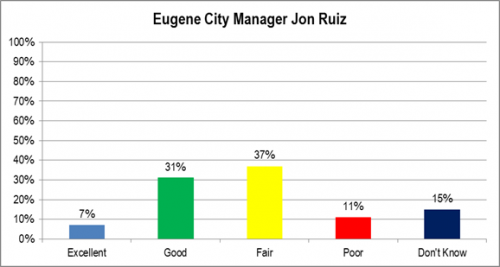 How would you rate the job Eugene City Manager Jon Ruiz is doing: excellent, good, fair, poor? Did Gov. Brown Do Enough on Ethics? 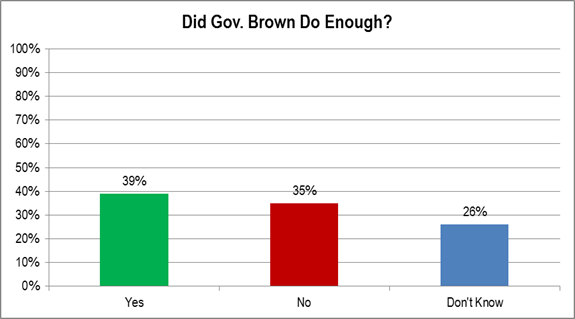 Oregonians are evenly divided if Governor Brown did enough on ethics. This can’t bode well. 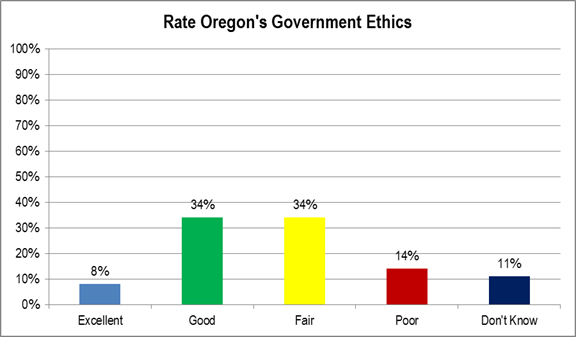 QUESTION: Did Governor Brown and the Oregon State legislature do enough to increase ethical standards? METHODOLOGY: Live telephone interviews of 400 likely Oregon gubernatorial general election voters were conducted July 13-15, 2015. The margin of error at the sample median is 5%. Quotas were established based on gender, age, party, and region. Totals may not equal 100% due to rounding. Category: Oregon, Political | Comments Off on Did Gov. Brown Do Enough on Ethics? It’s clear that there is no overwhelming confidence in Oregon governmental ethics. QUESTION: In the wake of Governor Kitzhaber’s resignation, new ethics laws were put in place. After these new laws, do feel ethical standards in Oregon’s government will be: excellent, good, fair, poor? The 2014 Primary Elections voters on average are clearly older than General Election voters. Source of Data: L2, Bellevue, Washington. 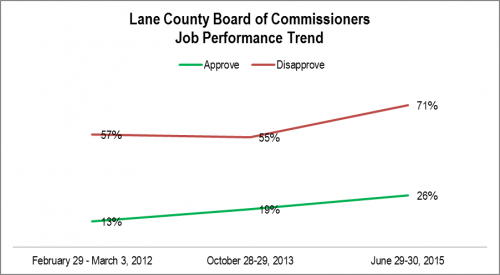 How is Lane County doing its job? None of these ratings is particularly good. Interestingly Lane County is rated relatively best treating the environment and worst on spending its budget. It is important to note that people rate what they see and rarely get into the minutiae of government. QUESTION: How would you rate how well Lane County is ___________ on a scale of zero to ten, where zero is worst and ten is best? METHODOLOGY: 200 live telephone interviews of Lane County likely general election voters were conducted June 29-30, 2015. The margin of error at the median is 7%. Category: Eugene and Lane County, Political | Comments Off on How is Lane County doing its job? Though the approval rating has increased significantly since 2012, the disapproval rating increased sharply since 2013. This is almost entirely due to undecided respondents moving into the disapproval category. 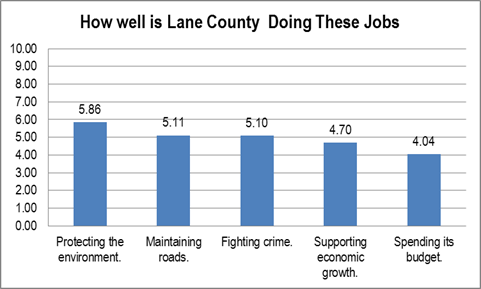 In other words, the good new is that more people are paying attention to Lane County. And the bad news for the commissioners is that more people are paying attention to Lane County. METHODOLOGY: 200 live telephone interviews of Lane County likely general election voters were conducted each of February 29-March 3, 2012, October 28-29, 2013, and June 29-30, 2015. The margin of error at the median is 7%. “Excellent” and “good” responses were grouped as “approve” and “fair” and “poor” responses were grouped as “disapprove.” This is a common methodology and is, in general, a better predictor of election results.